If you’re researching deck contractors and trying to determine which one to trust with your project in Columbia, Illinois, your search can end with Chesley Fence & Deck. We have a long-standing commitment to providing our customers with only the finest decking products and installing them with the utmost precision and attention to detail. 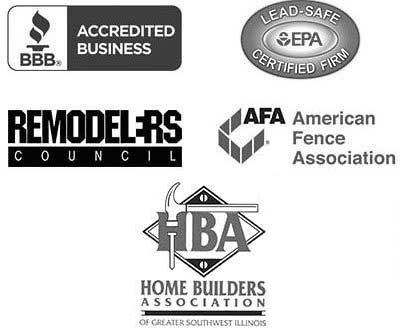 For these reasons, we have long maintained an A+ rating with the Better Business Bureau. Wood – You can choose from highly affordable treated lumber decking or premium cedar decking that has superior resistance to warping and cracking. Both of these products can be stained or painted to your liking. Composite decking – We provide several composite options, but we typically recommend our Tamko EverGrain® Envision ® PVC coated composite. 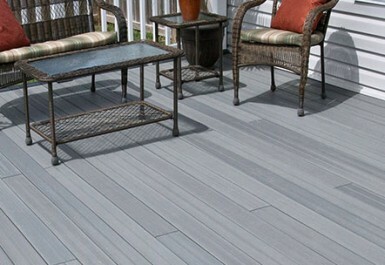 This product has a natural wood appearance, but is exceptionally durable, low maintenance, and resistant to staining, fading, and deterioration. In addition to offering the finest products, what truly sets Chesley Fence & Deck apart from other deck contractors is our personal service. For example, we take the time to understand your specific needs and preferences and will custom build a deck to your exact specifications. If you’d like to learn more about the benefits of choosing Chesley Fence & Deck over other deck contractors, contact us today. We are proud to serve homeowners in Columbia, IL.